This entry was posted in Curriculum & Exams, Education, Learning & Teaching, UK Politics, Uncategorized and tagged Baker, Gove, Gowers, Hoskins, Joseph, Mark Warner, Ofqual, Ofsted, Teacher training, Thatcher. Bookmark the permalink. Thanks for bringing this all together. I would add other stuff to the picture, such as the devaluation of the meaning of “apprenticeship”, and all that goes with it too, as the obvious standard bearer of another “qualification”. The devaluation of HND qualification. The devaluation of degrees and post grads themselves. The closing of secondary moderns and grammar schools and the implementation of comprehensives, and the various variations on what comprehensive meant on the ground where individual schools would run multiple schools within a school while paying lip service to their imposed ideological ways of working etc. And how such variations had dramatic differences in pupil results. I also look at all the bias in the system. From the obviously fraudulent claims of dyslexia (supported by private doctors happy to sign off the diagnosis) amongst some demographics because of the extra time in exams such a diagnosis unlocks, to the ways schools appeal exam results in very different ways giving some of them obvious bias in the results (because mostly the results of appeals of grades is higher grades being awarded). And so on. Taking it back to the days during and just after the war when poor working class kids glass ceiling was limited in much more obvious ways than it is later, and how the its gone full circle in many ways so that life chances are limited much more by things other than ability and hard work. “Standards” for me is also anecdotal. I see the modern output from “good” schools and feel they are a lot behind in so many ways the average school output in my day (yes I know I sound like an old fogey). But in comparison my father was always impressed at how much better the output from average schools were when I was there, than what was possible in the environment he went to school in. Some of this could be turned into quantitative measures of what is happening with a little thought. Plagiarism from the internet is also widespread now. At all layers of education. Immigration also plays a big part which the political bubble always ignores. From the kids from Spanish speaking countries being allowed to do Spanish A level here and use it to gain entry onto Uni courses, through to the challenges of class rooms full of kids not speaking English or even the same language as each other at home, the sheer pressure on the system in some places from the numbers, kids arriving from abroad mid-way through an education. And so on. And “standards” for me also means parents being happy with the output (of the school system). My father was dissatisfied with his own education, was broadly happy with mine, and I am and will be very unhappy with what my kids are subjected to. Full circle. You describe many of the issues well. What do you think the solutions are? Unconstrained by your knowledge of the barriers the system will put in the way? Myself I think we need a real empowerment of parents, giving them much more say and buying power, I don’t see the professional public sector, political, educational, or admin, as anywhere near as powerful a force for good change as individual parents empowered to move their kids to any school they want, and bargains between heads and parents replacing the current ways of doing things. I look at one of my neighbours who has pulled their child out of school in despair at the obvious blatant rubbish “standards” now being threatened with the law, and having no real choice other than to move house or let the kid go back to the same school. When its got to that stage there really needs to be other options and more buying power in the parents hands. A lot of what you say about “grade inflation” is probably right but there are a couple of missing bits. You say the content standard and assessment standard of GQs has changed and highlight evidence that might support that conclusion; you also allude to the impact on the performance standard of changing the structure of the qualifications (especially modularity) and that is also probably right – indeed it is a large part of the justification often given for modular qualifications. The question about the assessment standard is “why” – and I don’t think it was just (or even primarily) to make exams “easier” for inclusion reasons. A huge part of it was driven by the need for predictability and homogeneity in order to ensure reliable awarding, necessary to satisfy the increasingly high stakes school accountability system. You rightly note that this increased predictability has a negative backwash effect on teaching and learning and also probably contributes to “grade inflation” – but the driver was a need for reliability at the expense of validity due to high stakes government accountability. 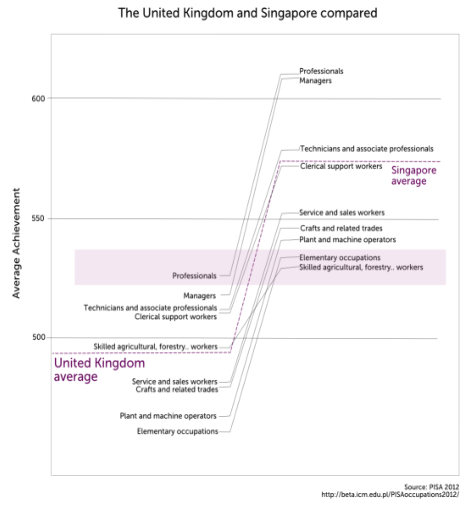 I wrote more about this here: http://cmre.org.uk/qualifications. The other issue is the grading standard, which you dismiss as being an unlikely cause when in fact it is pivotal. At the core of this are the flaws of criterion referencing which extensive research tells us is not reliable, in and of itself, and especially not in a high stakes system. A useful academic summary here: https://cerp.aqa.org.uk/research-library/setting-and-maintaining-gcse-and-gce-grading-standards-case-contextualised-cohort-referencing. In short, the evidence proves that human judgement is not a reliable basis in isolation for making awarding decisions, and this effect is probably amplified when the high stakes nature of qualifications provide an implicit incentive for awarders to give the “benefit of the doubt”. 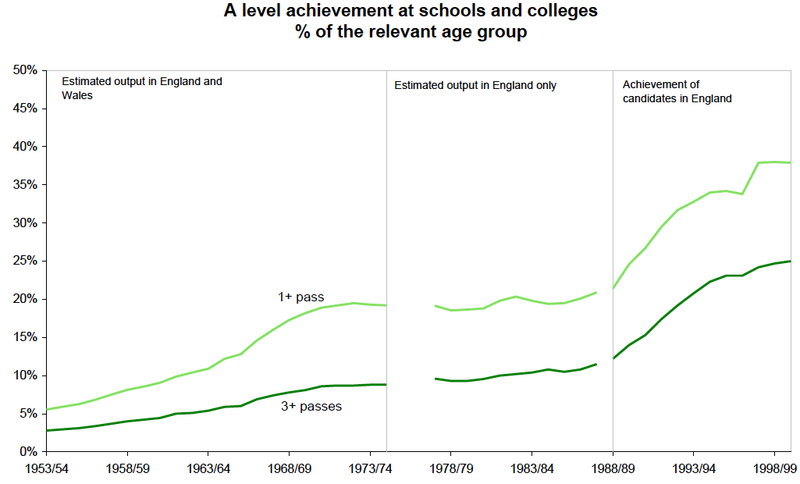 The creeping year-on-year effect of this was a major (if not *the* major) contributor to the very consistent improvement in qualification outcomes we’ve seen over the last 25 years. The “comparable outcomes” approach currently employed is of course designed to address this by significantly reducing the role of human judgement in the awarding process. 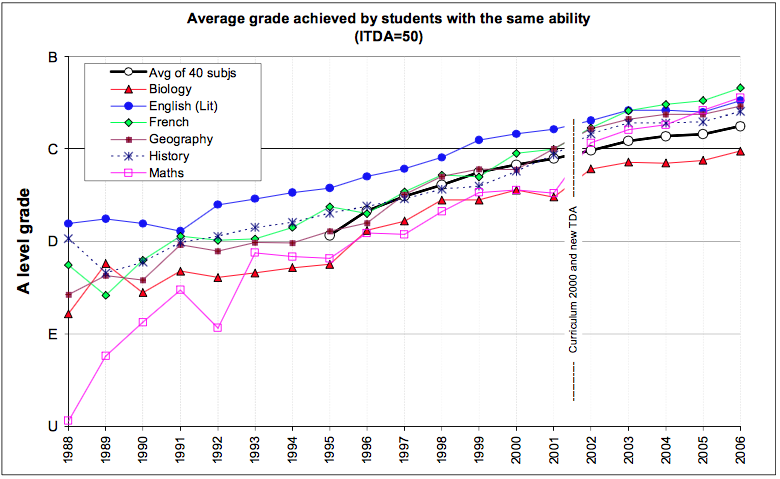 There are all sorts of problems with this but at least by defining your outcome in advance you stop “grade inflation”. That said, even if we weren’t concerned about rewarding putative improvements in performance, the system still isn’t perfect due to (a) its reliance on imperfect KS2 data to inform the statistical predictions and (b) the fact that the tolerances apply to the statistics still provide some room for “benefit of the doubt” decisions. Looking forward to your blog on the reference tests where we can discuss this further! 1. Your point re effects of trying to improve reliability/predictability etc and feedback with accountability is an important one that I meant to mention and forgot! 2. I did not mean to dismiss the grading issue – I just meant I did not think it could explain everything but my phrasing was poor, appols. I will read your link. 3. Ofqual has kindly emailed offering to brief me on where they are with comparable outcomes. The KS2 data reliability is clearly, as you say, an important issue. The reference test is happening – Ofqual has a tendering process underway at the moment. There are some real concerns both about the design of the test itself and how it will be used in awarding. 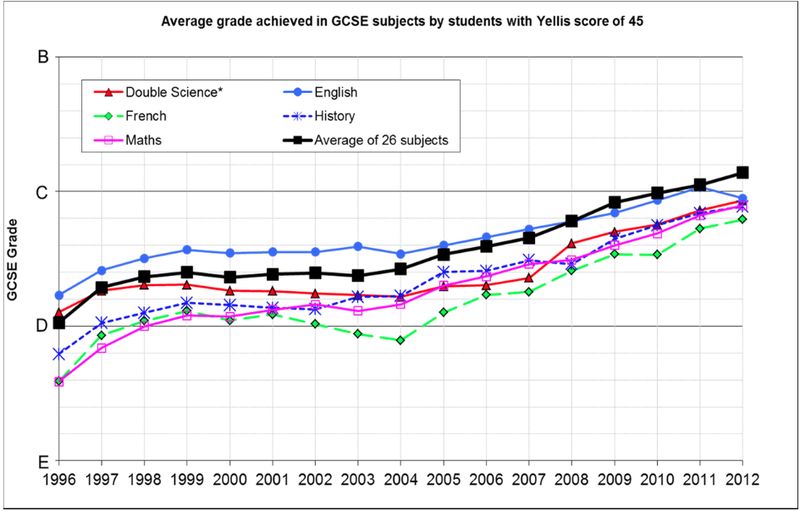 I’ve blogged on them here: http://policyblog.aqa.org.uk/2014/08/05/reference-tests-a-silver-bullet-for-gcse-grading/. As an aside, as a former undergrad Imperial mathematician, I can confirm that the whole of the first semester was (when I was there at least) a recap of Further Maths A-level. To be fair, they had to do this because not everyone had taken Further Maths, and the modular Maths A-level meant that actually you couldn’t really be sure at all which content everyone has covered. The new Maths and Further Maths A-levels from 2017 will improve this situation somewhat (Maths will now have zero optionality). Yes your experience is normal according to Richard Craster, head of maths there now, which is why they decided to buy in the Oxford exam. That action may also incentivise those who want to apply to Imperial to do Further Maths A Level too. BUT there is an ‘international student competition’ issue here too. I don’t think they publish the numbers but there is a large fraction now doing maths at Imperial from East Asia. One thing to consider with the introduction of the National Curriculum was that, at the same time, schools started entering students for more and more subjects. Given that there is a fixed number of teaching hours per week this necessitates a reduced number of teaching hours per subject at GCSE compared to the ‘O’ level days. A reduction in teaching time for a subject reduces the amount of knowledge/content that a student can be taught and it is inevitable (given that learning is hierarchical) that it is the harder content that gets ‘bumped’ to the next qualification up (ie. things move from GCSE to A level and A level to degree). Perhaps part of the issue is that not all Universities have adapted to address this in the way that A levels have adapted to address the shallowing at GCSE. There is, of course, a much wider (and important) question, about whether stretch and challenge for our secondary school students is best met through a wider range of subjects (to a shallower depth) or a smaller number of subjects but deeper content. 2. 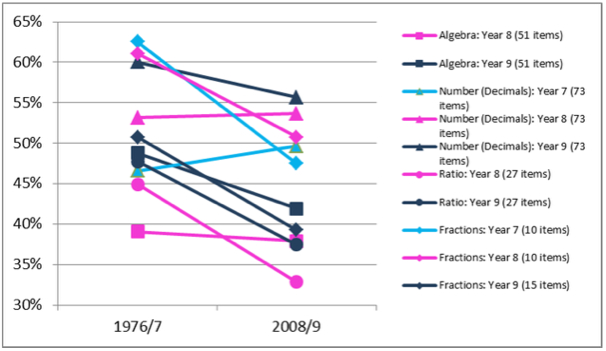 The research on the decline in maths skills among university entrants is pretty persuasive and makes use of evidence that departments have had to make changes to syllabuses in response but is it automatically the case that this is a bad thing? I don’t have any great expertise on this but I was an Oxford student in the 1980s and I remember some of my contemporaries studying science being pretty dissatisfied at some of the abstract and abstruse things they needed to study. I’m sure that academics steeped in their subject know what is needed for those who move on to PhDs and I also know that the really ace scientists invent amazing things but changes in standards and syllabuses aren’t automatically evidence they;ve got worse. I guess it would help if there was an HE PISA. Something else to add to Dale Bassett’s point. He says that there was pressure from school and colleges on awarding bodies to make GCSEs and A-levels more predictable because of their use in high-stakes accountability. We now have a situation where 1 million HE students take up student loan debts averaging £13,000 a year. The A level results play a significant role in determining where they spend this. Just at the point where university competition for students is heating up (because of the removal of student number controls), the reforms to GCSEs, AS and A levels will make student entry qualifications less predictable. This could result in an uncomfortable experience in the next few years and may create a new pressure to make things more predictable again. 2. Teachers. There are no league tables to chase for instrumental teachers and many of the best believe in the high standards and challenge of the exams (much like my A level French and German teachers believed when they chose the harder O&C board), with tasks such as sight reading and scales & arpeggios, which most children hate but which allow the best to shine and are fantastic for technique. If ever such perverse incentives arrived in music then teachers would chase easier exam boards. 3. Parents. They are ready to believe that a child’s result in an exam is a result solely of how hard they practised and how well they played on the day. There are no standards or observations of instrumental teachers and there are some rotten ones out there but there is no culture of blaming the teacher for a failure, even where, as examiners tell me, it’s obvious that poor instruction is the reason they are unable to play. 4. The ABRSM itself. It sets exams in what it can reliably and objectively mark. While GCSE’s and A levels include many worthy but subjective activities such as composing the ABRSM never has. The pieces set are as hard as ever – a current grade 7 piano piece is the same I played for mine 20 odd years ago. Other exam boards are (anecdotally) easier. It is, of course, entirely possible that poorer performances are getting higher marks as children have less time for practice and I have suggested this myself. David Didau says he doesn’t trust my memory of how well I performed in exams. A levels are certainly easier, particularly since 2008. I could go into lots of detail another time if you like. I therefore think that the way to teach people in top sets at schools is not to work towards those exams but just to teach them maths at the pace they can manage < Isn't this the ideal for every set for every subject? The question is whether it is possible in the way that we currently do school, i.e. 30 kids in a class and one teacher. I used my talk at researchED in part to argue that the most urgent task facing educational psychology is to establish a research programme that aims to find out what pupils can achieve within the constraints of different ages, IQs, and teachers. It’s crazy that this has not been done properly to date, or even attempted as far as I know. Recently I came across some primary blogs analysing the recent rise in standards at KS2. Both the bloggers’ analyses and the standards themselves are based on little more than guesswork – are the standards now too ambitious for 80% of children? Or achievable for 80%? Or achievable but only with much better teaching across the system? Who knows? Who has the faintest idea? It should not be beyond the wit of man to sort this out. It will require a program that is both large-scale and under close control; pupils and teachers cannot be allowed to be come unrepresentative of the wider population. This is not logistically easy but nor is it impossible. re standards: I did Latin & Greek for both GCSE & A-level as well as Classics at undergraduate (only switched to Ed Psych for my MSc). While tutoring Latin & Greek primarily for Common Entrance and GCSE, it’s obvious there’s been a collapse of basic standards even in expensive prep schools, and not just for Latin. Upon starting with a new pupil my first questions are always “what is a noun? What is a verb? What is an adverb? What is an adjective?” These are things that should have been mastered in English lessons, but a surprisingly high % struggle. Latin itself is very badly taught, mostly because the major textbooks (Oxford and Cambridge Latin Courses) are atrocious and lack any grammatical rigour. The only good course I have found that is not of a pre-WWII vintage is Nick Oulton’s So You Really Want to Learn Latin. As a result material once set for O-level unseen translation is now studied as a prepared text at GCSE. Tick-box marking exacerbates the problem. I sat the A-level English papers knowing that I was going to get a clean sweep of top grades because I knew that I was writing perfectly to the Assessment Objectives. It seems ridiculous that it is possible to get 100% (as you can, or could, in A-level English) in an inherently subjective discipline: I doubt that even a reincarnated Mozart would get 100% in his Grade 8 music Associated Board music, but NB I could be wrong about this. In other subjects it is possible to write semiliterate gibberish and still gain high marks if you have managed to make the relevant points, no matter how incoherently. Real life is not so forgiving. Obviously I agree re the research programme. Nobody wants to touch it. I will explore this more shortly. The Premium idea is reasonable but politically untouchable for the same reason. If one could get the research programme off the ground, then it would be easier to do the Premium change. But it would be almost impossible to do the latter first. Many thanks for collecting these thoughts together. If anything, I think you understate (which is probably the right way to err). (iv) competition between exam boards for market share. All of these then interact to reduce “education” to “exam-preparation” (which is further exacerbated by the DfE’s and Ofqual’s failure to eliminate exam board endorsed texts and materials). Somehow (though it is hard to see how) we have to get back to a professional view, and supporting bureaucratic structures, that make it clear what it is that needs to be taught and learned without thinking about exam-preparation until very late in the day. Healthy learning is very different from, and always way ahead of, what pupils have internalised sufficiently robustly for it to be subjected to reliable examination. When learning mathematics one has to struggle with things in general form that could not possibly be assessed at that level. One has to be free to make all sorts of mistakes and establish connections. This continual process of internal re-organisation is slow and messy; and at any stage one is only ready to robustly tackle things on a much lower level. Where the focus is on exam-preparation, thee cheap inference is that one might as well ignore the harder, general form, and spare students the mistakes and the connections – since they will not be tested (yet). However, it is precisely this more general, more demanding material, and the discovery of connections, that determines subsequent progression. So the attempt to achieve the best result with the least effort in the short term also guarantees large scale failure to progress in the longer term. This “failure to progress in the longer term” is completely general. It explains why we have such a long tail of underachievement at the bottom end: our attempts to maximise their short-term results often make it even more difficult for them to progress – so the spread increases. The spread does not increase because the top is racing away – for the effect at the top end is even more marked. In FIMS (1964?) England had a very strong top end. 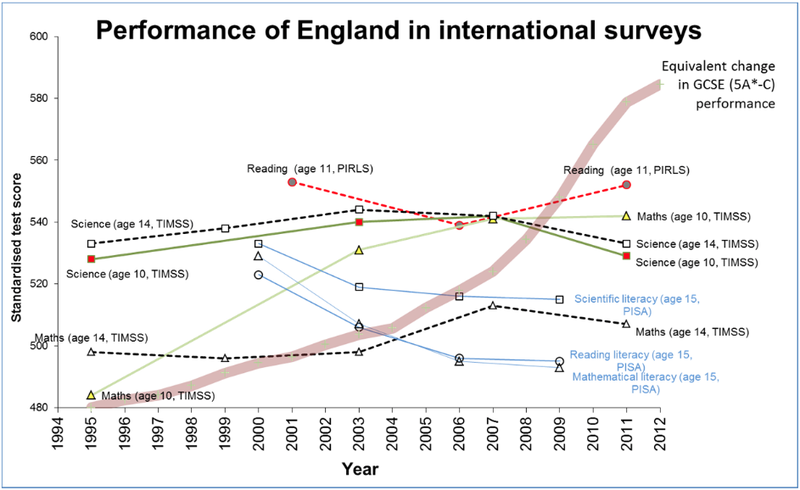 TIMSS and PISA show that our top end has almost disappeared: the percentage of students performing at the top level – which is not all that high – in each of these assessments is between one third and one half of the international average (and that average is misleading in that one would not wish to be compared too closely with many of the systems being averaged). Is this study worth adding to the above on changing standards over time? An interesting summary of some of the issues relating to GCSEs, A-levels etc. I feel that the ABRSM music exams represent a near perfect form of assessment, and, as you mention there has been no grade inflation for all the reasons another commenter has noted – the fact that the syllabus is set by experts, maintaining consistency is easy, and there is very little subjectivity in the examination – whilst music is inherently artistic and expressive, the level of exam offered by ABRSM (in the grades 1-8 format; there are, of course, the diploma qualifications) is sufficiently low to avoid any marking issues arising from a difference in musical ideals between two examiners. I use their exams as an example on my own blog post about the handling of raw marks from assessments. Perhaps more interesting is the fact that the music A-level has remained challenging, and grade inflation has not been severe. The reasons for this are not clear, and as a result of the UMS system it is virtually impossible to ascertain why the exam boards have made the decisions they have about grade boundaries. The A-level itself is, from anecdotal evidence, difficult and challenging, and I know several music teachers who have belief in it as a tool for measuring musical ability – I know no teachers who have full faith in the exams for any other subject. The mechanism by which grade inflation has occurred has been both a reduction in difficulty of the exams, but, perhaps more crucially, the manipulation of data via the UMS system. These issues would not present such an acute problem if the results from exams were not misused, and were not scrutinised to an extent that their accuracy does not merit. My experience of studying the modern science GCSEs makes it obvious to me that there are serious issues with them. It was much lamented by the scientific community that the practical coursework was to be removed from the new GCSEs, though in reality it was an utter waste of time – teachers cheated, bottom set pupils got nearly full marks, and it effectively became a free 25%. The syllabi themselves contain information that is either fully incorrect, or oversimplified to the point of worthlessness. For example, the life cycle of stars in GCSE Physics is wrong, and the electrolysis of aluminium in GCSE chemistry is wrong – at least, according to Jim Clark (Cambridge chemistry graduate, teacher, writer of Edexcel IGCSE chemistry). 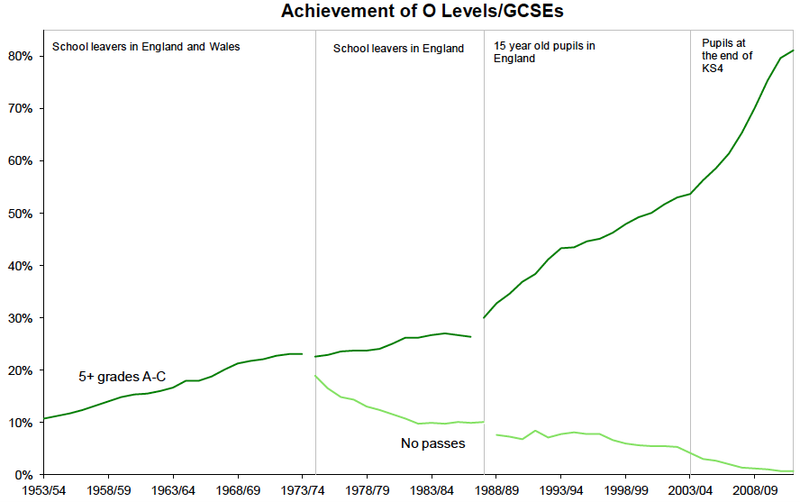 As someone who has just finished A-levels at a good state school and who has an offer from Oxford University, I found this blog post this very interesting. Firstly, one must recognise that schools can only teach so much. They have limited time, limited resources and only so many teachers. This situation is not being helped by the budget cuts schools are experiencing. Although I think some of Gove’s reforms were good, what many of the subject changes have led to is the requirement that schools teach more in their courses. A case in point: one of my A levels was politics, and for it I had to be taught 4/6 units offered by AQA. Under the new A-level, students taking AQA politics will have to learn effectively what I covered in the 4 units I did plus the content of the other two units. While this means that new politics students will cover more, teachers will simply be unable to teach them as much detail as I was taught. 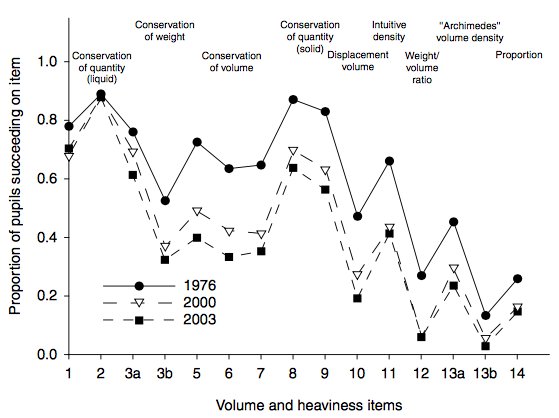 Quantity, not quality, has been prioritised, and likewise for other subjects. Do you think this system actually improves the education students are receiving? I accept that universities what their students to start with a good understanding of almost all aspects of the subject, but it is harder than it seems to implement that to a satisfactory standard due to time constraints. On a slightly different subject, I found your comments about classics quite intriguing. When I was applying for university, I was struggling to choose between studying history or classics. In the end, I went for history. However, when I looked at classics course pages on universities websites, I noticed that in most universities (including Oxford) you do not need to have studied Latin or Greek to take at least one type of classics course (at Oxford, Classics II). Although this leads to a greater number of classics students without good or any understanding of Latin – which I can understand frustrates some academics – surely this development is to be welcomed in that it makes classics courses more accessible to students from state schools, where ancient languages are unlikely to be taught? If universities required prior, study of Greek or Latin for a student to take the course, it would make classics the preserve of those from private schools. I recognise that increasing the ability of state-schools to teach Latin/Greek is, in the long term, preferable to lowering requirements and standards. Yet in the short-term it seems reasonable for universities to lower requirements to encourage more state-schooled students to attend before initiatives to promote Latin/Greek study in schools take effect. Unfortunately, ongoing budget cuts are threatening the ability of those state-schools that currently teach Latin/Greek to offer courses like Classics. I would appreciate any response to my comment, though I realise am commenting over two years after you posted this blog. Thanks.